FOR USE ON HOME LAWNS, LANDSCAPES, and PARKS IN NORTHERN CALIFORNIA. West Coast Turf’s exclusive West Coaster Fescue & Blue sod makes for the ultimate lawn in Northern CA! 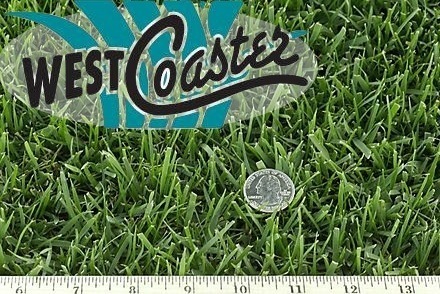 West Coaster has a beautiful dark green color, with lasting wear, drought, and heat tolerance, and excellent disease resistance. It can also tolerate partial shade, and is ideal for home lawns, landscapes, and parks. It performs well in coastal California, as well as cool inland valley and high desert environments. West Coaster Seed is available for easy repairs. Also available in "No-Net West Coaster"--the same great Blue/Fescue mix, but without pesky plastic netting! Provides year-round green in the Southwest. Deep root system ensures drought and heat tolerance. Excellent adaptability and can thrive in a wide range of soil types. Tolerant of saline soils and saline irrigation water. Once established, provides superior wear tolerance. Dense growth habit makes it highly resistant to disease. 1” to 3” with a rotary mower. Regular Sod comes in 8 sq. ft or 10 sq. ft. rolls. Big Roll sod is 42” wide by up to 100’ long. Seed comes in 5 lb. bags for easy repairs.